The Buffalo Beauts stunned the women’s hockey world this summer with the goaltenders they signed during NWHL Free Agency. Two of the netminders they brought on board are Olympic gold medalists, while the third is a returning veteran from the 2017-18 season. The first one to be signed though, is 24-year-old Nicole Hensley who is fresh off of winning gold with Team USA at the 2018 PyeongChang Winter Games. After graduating from Lindenwood University following the 2015-16 season and then continuing on as a member of USA’s Women’s National Team, the 2018-19 NWHL season marks Hensley’s first as a professional. Nicole Hensley is primed to make her regular season debut for the Buffalo Beauts (Photo Credit: Pat McCarthy). Pegula Sports and Entertainment acquired the Beauts only four days before Christmas 2017. This summer after the 2017-18 season had ended was the first that the Pegulas and the Beauts new management structure were able to truly put their stamp on this team and decide its path going forward. 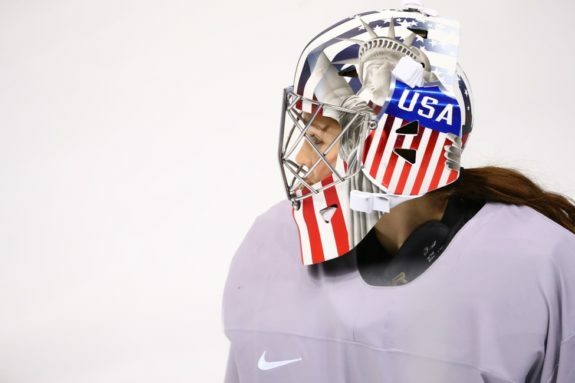 Buffalo made multiple marquee signings in the past few months, including Hensley and other prized Olympians Shannon Szabados, Emily Pfalzer and Dani Cameranesi. THW spoke with Hensley after the team scrimmage and before the Beauts embarked to Colgate University where they were to play the Connecticut Whale in an exhibition game on Sept. 23. Hensley shared some insight into getting acquainted with her new teammates and what the 2018-19 Beauts are all about. The offensive power of the Beauts is quite formidable. Returning forwards Maddie Elia, Hayley Scamurra, Taylor Accursi, and Corinne Buie each hit double digits in points last season. Defender Sarah Edney’s three goals tied her for second-most scored by NWHL blueliners in 2017-18. Safe to say that Hensley and the other two Buffalo goalies’ have a strong support system in front of them. Hensley grinned good-naturedly to the media after having been beat for four goals by her teammates in the opening period of the scrimmage. That being said, Hensley can do plenty of supporting all on her own. Playing for Lindenwood University from the 2012-13 season through 2015-16, she played in 123 games for the Lady Lions and went 30-78-12. That record is not an accurate depiction of her own performance though, as Hensley’s goals-against average in her four years was a paltry 2.98, while her career save percentage came out to .921. Her 4,094 career saves are the most in NCAA history. During Hensley’s freshman year she made 90 saves in a single game, and allowed just two goals in a Mar. 1, 2013 contest against Robert Morris University. The Buffalo Beauts goaltending is not all about Hensley though. The trio of goalies are conceivably the finest collection on one team in women’s hockey today. Many feel that the 32-year-old Szabados – a three-time Olympic medalist (two gold, one silver) – is the all-time greatest goalie in women’s hockey history. Her addition to the NWHL is arguably the most noteworthy signing of the year. As for DiTondo, she and Hensley actually faced one another in a Feb. 20, 2015 game between Lindenwood and the Mercyhurst Lakers. Both DiTondo and Beauts teammate Emily Janiga played for Mercyhurst in that particular game, while Hensley was in net for the Lady Lions. Hensley and Szabados faced each other twice during the 2017 IIHF Women’s World Championships in Plymouth, Michigan. It was the young American who got the victory both times. Hensley first whitewashed the Canadians 2-0 during a Mar. 31, 2017 contest in the preliminary round. She would then backstop Team USA to a 3-2 overtime win over Szabados and Canada in the gold medal game on Apr. 7, 2017. In that particular showdown Hensley faced 40 shots to help bring USA gold, while Szabados faced 30 of her own as she and Canada won silver. Hensley recognizes that there is a lot to benefit her by having Szabados and DiTondo as her goaltending partners. The trio are able to bounce ideas off of each other and support one another. Keep in mind too that although DiTondo did not see any regular season action last season, she still has a year of NWHL experience under her belt while the league is something new completely for Hensley and Szabados. The three of them will learn from each other as the 2018-19 season goes along. Obviously Hensley has plenty of new teammates she is getting acquainted with besides her fellow goalies. Other than Pflazer and Cameranesi, there are not many of her new teammates that she knew before signing with the team. Some like DiTondo she had faced before in college, but the majority of her fellow Beauts she did not know well – if at all. Through a series of team building moments both on and off the ice, Hensley is getting accustomed to Buffalo and being in the NWHL. The Beauts are energized, and that energy continues to mount. For the newcomers like Hensley, part of the process is finding out what being a Buffalonian and Buffalo sports are all about. She welcomes the opportunity to take it all in, and she is counting on the returning Beauts veterans to help her get a feel. There is no place that Hensley would rather be right now than with her new team and being part of the all-in focus to bring the Isobel Cup back to Buffalo.